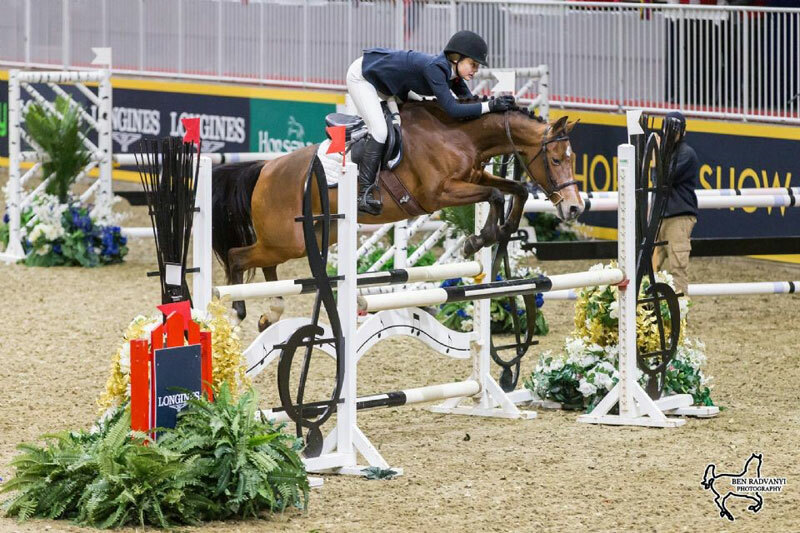 Kilby Brunner Deforest of Hillsburgh, ON, claimed a victory in the $5,000 MarBill Hill Farm Royal Pony Jumper Final to take the division championship riding Beaverwood’s Halo on Sunday, November 3, at the 96th Royal Agricultural Winter Fair in Toronto, ON. The top spots were decided in a two-horse jump-off duel between 14-year-old Brunner Deforest and Tatum Horan of Oakville, ON. Horan, riding Royal, led off and was clear over the course, designed by Ireland’s Alan Wade, to post the time to beat at 29.50 seconds. Brunner Deforest returned second and handily took over the lead by nearly two seconds with a time of 27.88 seconds. Grace Stevenson of Lakeside, NB, piloted Ever So Clever, owned by Foshay South Eventing, to third by posting the fastest four-fault round over the original course, while Eva Marquis of Caledon, ON, settled for fourth riding Red On A Roll for owner Mark Marquis. Maya Chahine of Oakville, ON, rounded out the top five with I Love Lucy, owned by Julie Taddeo. After also winning the stake class earlier in the day, Brunner Deforest was presented with Royal All-Canadian Pony Jumper Championship title, presented by MarBill Hill Farm. “This is my fifth time competing in the pony jumpers at The Royal, and it’s exciting to be here!” said Brunner Deforst, who was reserve champion in pony jumper competition at The Royal in both 2016 and 2017. “This is a new pony for me; I got her one year ago and have been competing on her all summer. While Brunner Deforest and Beaverwood’s Halo put all the pieces together for a win at the Royal Horse Show, their connection took some effort.